I made this a few months ago and failed to share it with you. How could I? From time to time I test and photograph a recipe from one of the members of Tasty Kitchen, the fabulous community recipe website of my friend Ree. Well I tested this one and it was lovely and you ought to know about it. 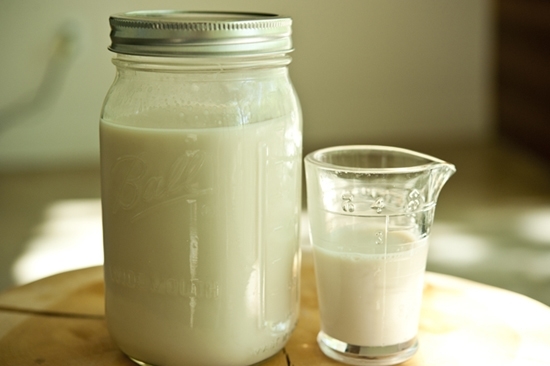 One thing that is pretty much always in my refrigerator is almond milk. I love the nuttiness of the plain and vanilla flavors. And the chocolate almond milk? There’s just nothing like it in a tall glass of iced coffee. It also never occurred to me how simple it is to make it. 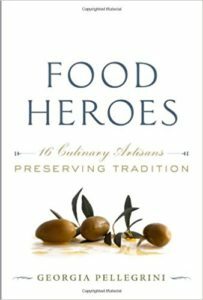 Literally all you need is almonds and filtered water, along with any flavorings you’d like. In this case, I tried vanilla and a bit of honey. 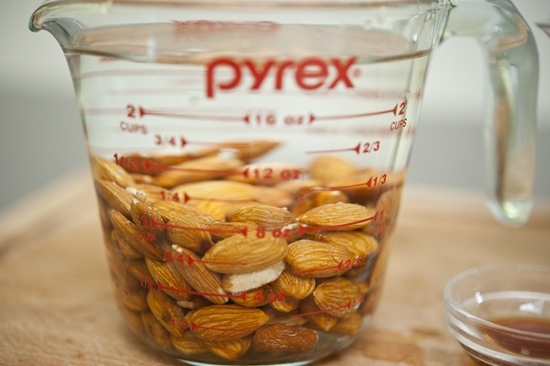 The main thing is to soak the almonds in water for up to 6 hours, which will soften them and make it easier to extract the flavor from them once they are blended. 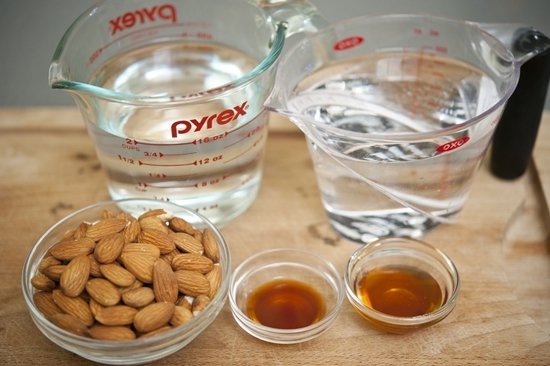 One other option is to use blanched almonds without skins for a very pure color. But hey, I don’t mind beige almond milk myself. 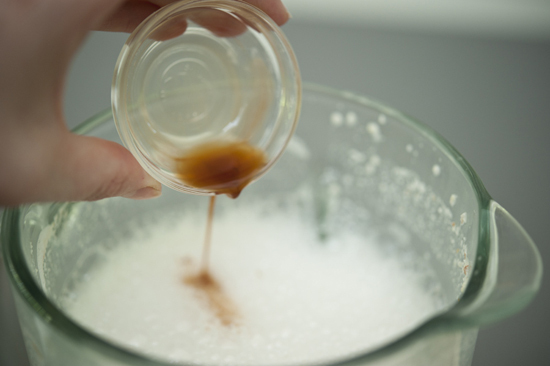 A nice head of foam will start to form and that’s when you can stop and add the flavorings. I added vanilla. You could skip this or add cocoa powder, chocolate syrup, cinnamon, and so many other things. I also added some honey from my bees here. But you could try stevia or maple syrup or leave it plain too. 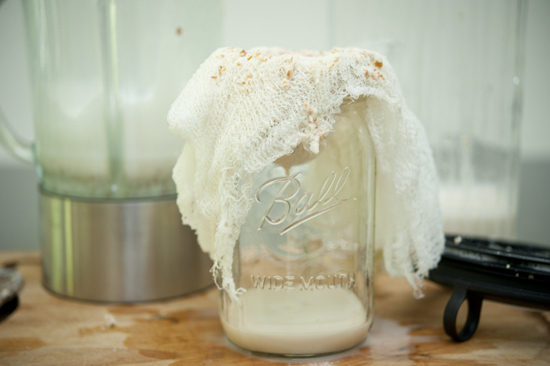 Cut a swatch of cheesecloth and layer it into about four layers. Give it a rinse under cold water and squeeze out the excess. 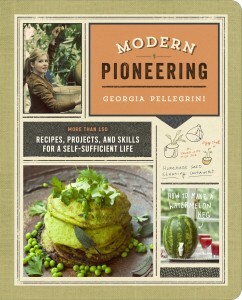 Then drape it over the mouth of a pitcher or Mason jar. If you want to help yourself out you can secure it with a rubber band. 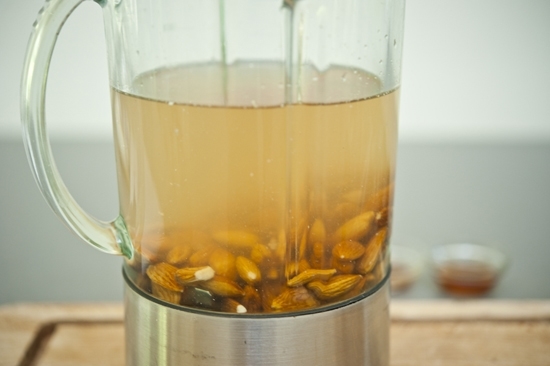 Pour in the liquid a little at a time, pressing the excess ground almond that gathers as you go. Your contraption will look something like this. Keep adding until you’ve pressed in all of the liquid. 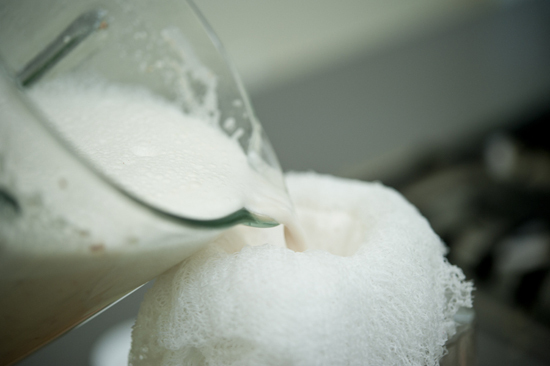 And there you will have homemade almond milk! What an awesome idea! This sounds so good! This is SO cool, Georgia. I have have have to make it. Also, I was 30 miles away from Lake Village this weekend (in Crossett) and thought of you! 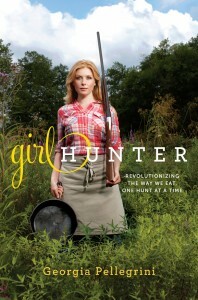 I am really pleased I was directed to this recipe and site. I follow as “Natural wayof life” as possible. to purchase the almonds … Will let you know of my success when it becomes reality. 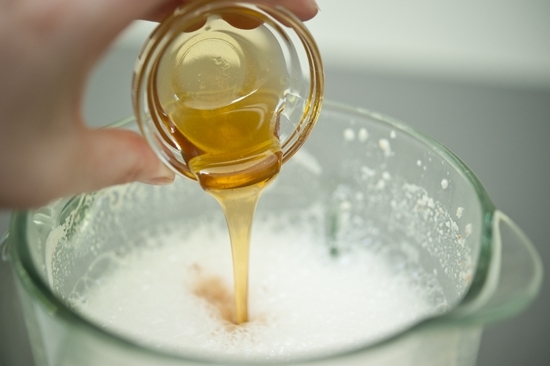 You can also take the pulp left and cook it in the oven and make almond meal… Use it like flour in recipes! 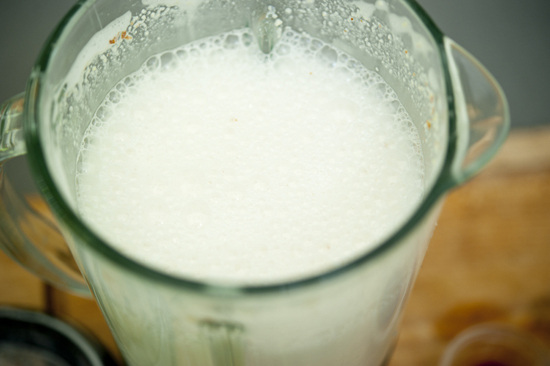 Or you can use the milk to make almond cheese and almond yogurt!! All great ideas, thanks for adding them! think muffins, bit of sweetener, egg or 1/8 c flaxseed ground to 1/4c water, let set use as substitute for egg, this equals to 1 egg. 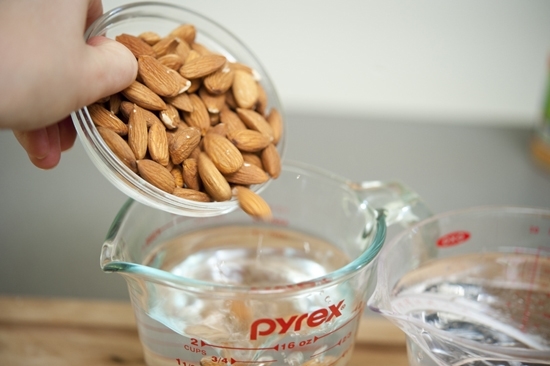 Instead of buying bleached almonds, you can drop the almonds in boiling water, let set a few minutes, add cold water, to lower temperature, then rub between two fingers the skin will fall off easily, then continue with your recipe, it does look like milk, then. First let me start off by saying, thank you so much for posting this! My family is new the natural eating, and we are newly in love with almond milk. The only question I have is, I am not seeing the measurements? Am I missing something? Hello, I tried making this and ended up leaving my almonds soaking for 24hrs. It developed a thin foam on the surface. Is this still ok? Or did I let it soak for too long and it’s gone bad?